This Espresso Brown finish coffee table is perfect for any sized gaming room. Impress your friends with this stylish, sturdy and one of kind piece. Dragon Quest VI: Realms of Revelation Table Top Standee Nintendo DS RARE PROMO!! Listing is for a used Dragon Quest VI: Realms of Revelation Table Top Standee. This is used as it was displayed in store at a Gamestop but it is in excellent condition. Please refer to the pictures for the dimensions. DS GAME IS NOT INCLUDED!!! I placed it there for size reference. This is a very rare promo item and i have never seen one listed on Ebay. 5 out of 5 stars - Dragon Quest VI: Realms of Revelation Table Top Standee Nintendo DS RARE PROMO!! 4 product ratings4 product ratings - Dragon Quest VI: Realms of Revelation Table Top Standee Nintendo DS RARE PROMO!! DONKEY KONG JR 1983 Mini Arcade Video Game Electronic Table Top Coleco Nintendo. Condition is Used. Stickers on one side have been scraped. Sticker on front is peeled up on top corner. It’s also missing battery cover. Does turn on and play. Look at pictures for better details. Shipped with usps Priority mail We ship all items wrapped in bubble wrap and ship them in a sturdy box. Illuminate any space with a soft glow and geeky style with the Nintendo Super Mario Block Table Lamp. This Super Mario table lamp features a block table shade with the iconic gaming icon, along with a green, grass-like base for added color and geeky flair. Vintage 1981 COLECO Nintendo DONKEY KONG Table Top Mini Arcade Game - Works. Condition is Used. Doesn’t come with batteries. Shipped with USPS Priority Mail. Made from solid wood. 38-1/4" long x 16"wide x 19" tall. 7" tall with out the legs. NEW Has been folded in storage since 2004 48" x 70"
Never been played, kept in storage! The system is totally plug and play! This table is a very rare piece of custom furniture, especially at this level of quality and with these features! If you have a US system then yes it should. Battery cover is included. Works great, no issues at all. Box does have minor wear. Unit itself is in great shape. Condition: used - good condition. Super Mario Bros Table Cover Features: Plastic construction. Perfect for Mario fans and fantastic for any children's party this cheerful table cover is great for any celebration. Your box will be marked with fragile stickers. Stylish handcrafted Zelda Lamp for end tables, night stands, bookshelves, heroic adventures, etc. The colored front shines through translucent acrylic, and is very sturdy. New ListingVintage 1981 COLECO Nintendo DONKEY KONG Table Top Mini Arcade Game - Works! Vintage 1981 COLECO Nintendo DONKEY KONG Table Top Mini Arcade Game - Works!. Condition is Used. Shipped with USPS Priority Mail. Game is in good working condition. Bottom of the game is heavily taped with black electrical tape. It was purchased in this condition, so I assume it’s missing a panel or battery cover of some sort. Vintage 1981 COLECO Nintendo DONKEY KONG Table Top Mini Arcade Game - Works. Condition is Used. Shipped with USPS Priority Mail.Game has the faceplate missing,& some stickers gone,& peeling. New batteries included game works as it should. AS IS NO RETURNS. Nintendo Popeye table top game and watch side art decals. New. Decals only! 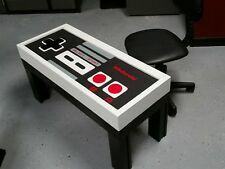 I was asked by a ebay member to try and make side art for the Nintendo tabletops. This is what was created for the popeye. Decals are laminated and self adhesive. Buyer has to trim the decals the way they want them to look. Game is shown with a decal I cut out and is not part of the sale. Game is not part of the sale!!! Nintendo Donky Kong table cloth made by Beach products. For kitchen, picnic, weddings, Bar Mitvahs and banquet tables”. There are aging degradation especially box.